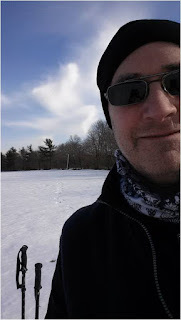 I decided to go straight for an outdoor workout today and headed over to the middle school for some snow shoe trekking. There's still plenty of snow cover, but the roads are free of it. Wearing snow shoes on pavement is a no-no because of the crampons, so I elected to take a short drive over to the school. It's difficult getting my boots into the bindings, so I put them in beforehand and then stepped into my shoes when I was ready to start. Once equipped, I walked onto the field and headed out. The school field's perimeter is about a half a mile if you keep to the far edges. I thought I'd do a few laps around and see how it went. I started moving at a brisk pace but had to ease up a bit after a quarter mile. Like running, you need to anticipate that you will heat up over time. Unfortunately, I didn't do that. After ten minutes I was ready to shed my top layer and ski mittens. Instead of laps, I followed the snow where it drifted and where there were interesting areas to "explore." I criss-crossed in both directions and, just for fun, spelled out ER in honor of the eponymous blog. Going in a straight line over a period of time (versus the frequent slowing and turning required in my backyard) was ultimately wearying and certainly a good workout. I tried to gauge my level of exertion compared to running and ellipticalling. Running in snow shoes felt comparable to hard track intervals, while brisk walking felt like a challenging hike. Overall, I'd position the effort of snow shoeing as somewhere between running and the elliptical. Of course, that comparison only applies to me. People who are elliptical maniacs may consider that a harder workout. Then again, those people would probably be snow shoe maniacs too. Were you tripping on shrooms when you were out there? I hope people were watching you. I'm sure they would have been both amused and afraid at the same time. I also find it interesting that your picture is completely snowless. You're obviously not a great explorer like me. And I don't need shrooms to walk around randomly in circles. For some reason people stayed very far away from me. You make a great point about the course. Next time I'll make sure there's snow on the ground when I use my snowshoes.